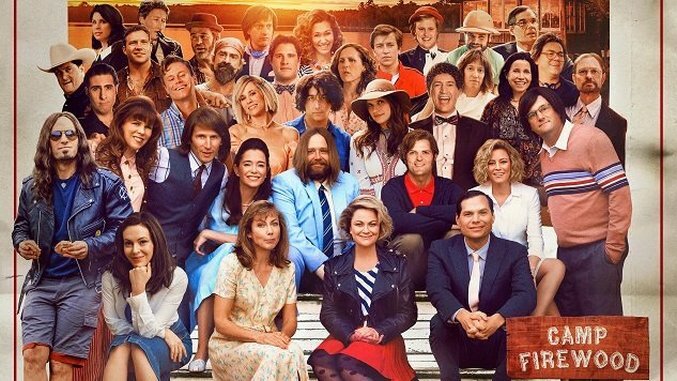 This week, after sixteen years, one prequel series and plenty of careers skyrocketing, Wet Hot American Summer will finally be receiving a sequel. Ever since the film hinted that the Camp Firewood counselors would reunite in 1991, fans have eagerly waited to see how an entire decade would change this group. Wet Hot American Summer: 10 Years Later, out on Netflix this week, answers that question. With 2015’s Wet Hot American Summer: First Day of Camp, creators Michael Showalter and David Wain answered a surprising amount of questions that the film raised, questions that probably didn’t need to be answered in the first place. Did we need to know why there’s a can of vegetables that can talk? Or if Gail ever had crayons? Or who the hell is Jim Stansel? Not really, but the WHAS crew added an extra layer to these characters we know and love, giving us a further understanding of this insane world that they inhabit. With that in mind, let’s take a look at some of the loose threads presented by the Wet Hot American Summer film and the WHAS: First Day of Camp prequel series, and see what other questions 10 Years Later should answer when it premieres. What happened the other eight weeks of summer? If First Day of Camp and the film are any indication, every day at Camp Firewood builds to an unpredictable, life-altering conclusion, whether it’s a piece of SKYLAB falling on the camp, or President Reagan traipsing into town in a tank. Considering that Camp Firewood summers are eight weeks, that means there are fifty-four other days of love stories, friendships and cataclysmic disasters narrowly averted that we missed from the summer of ’81. Not to mention that there have been ten entire years we haven’t seen since WHAS. Frankly, the rest of the summer probably can’t live up to the excitement of returning back at Firewood, or saying goodbye to the friends made over the eight weeks on the final day, but there’s still got to be some stories that we’re not getting. Maybe 10 Years Later will hint at major events we missed in this period, or we can just hope for another season that shows the rest of the summer of ’81. Will Victor ever lose his virginity? I mean, how could he not? With those tiny jorts, Birkenstocks and tightly-permed hair, it’s insane to think that Victor (Ken Marino) made it through the summer without losing his virginity. On the first day of camp, he had his chance with choreographer Rhonda (Michaela Watkins), but couldn’t figure out how condoms work, and on the last day of camp, he snoozed and therefore losed his chance with Abby Bernstein (Marisa Ryan). With the camp crew getting back together, has Victor lost his virginity yet, or will he finally lose it with one of the old group that he has yet to pollinate? Will Coop ever find love? What happened between Coop and Susie? In the movie, there’s a quick throwaway moment where Katie is trying to find a girlfriend for Coop, where he nonchalantly mentions that he and Susie (Amy Poehler) dated in Coop’s first summer at Tigerclaw, back when they were ten. We rarely ever see Katie and Coop interact, but when Coop is looking for Katie later in the film, the first person he runs to is Susie. Maybe this is making a mountain out of a molehill (it almost certainly is), but maybe Susie is the one who Coop should be with. Sure, it could have been two ten-year-olds having fun in their first summer together, or maybe it’s something more that we have yet to see. What does McKinley have to do at 11? True to their word, the crew of Camp Firewood meet up ten years later at 9:30 in the first episode of 10 Years Later, making it their beeswax to be there on time. But as the movie mentions, McKinley (Michael Ian Black) thinks so far ahead, he already had an appointment he had to move at 11 am on the same day. As we see in the trailer, McKinley has a busy life a decade after we last saw him, married and now with a kid. But when 11 comes around, what is it that McKinley could’ve possibly had to do? Maybe it has something to do with him and Ben sharing their anniversary on the same day as the reunion? How is Jason Schwartzman’s Greg still alive? When we last saw Greg in First Day of Camp, he and Beth (Janene Garofalo) had sparked up a relationship, but he then was soon shot in the head by The Falcon (Jon Hamm). Greg’s last words were “save the can,” before he died in Beth’s arms. So…why is he in the trailer for 10 Years Later? In First Day of Camp, Firewood was a dumping ground for toxic sludge, which apparently had the power to turn people into cans of vegetables. Before he died, Greg did eat quite a bit of said sludge, which could potentially have kept him alive. Or maybe like getting addicted to heroin, Wet Hot American Summer will just ignore that Greg ever died in the first place. How did Chris Pine’s Eric also survive getting shot and falling off a camp bunk? Similarly, the final episode of First Day of Camp had the U.S. government kill Eric after he united rival camps through song. After his murder, the series ends with Eric getting in a truck, seemingly fine the very next day. Considering that Eric had been hiding in seclusion at Camp Firewood for years, is it possible that Eric created a decoy of some sort? His song “Higher & Higher” surely would’ve catapulted him into stardom that he might not want, so was Eric planning on his own execution from the beginning? The trailer for 10 Years Later shows Eric fighting off an unknown person, so it seems that Eric is no stranger to violence. Whatever the answer, Pine was one of the best additions to this universe, and it’s just great to have him back, taking things higher and higher. Where did Steve get his super powers? Steve (Kevin Sussman) is one of the few WHAS characters in both the film and series that we know very little about. We know that he’s the brother of J.J. (Zak Orth), he likes to talk like a robot and that he’s incredibly antisocial. Oh, and that he has superpowers that saved the camp from getting crushed by SKYLAB. Steve seems able to create huge gusts of winds out of nowhere and also save the day whenever he is needed, as seen in First Day of Camp. Basically, Steve is Camp Firewood’s superhero. But how did Steve get these powers? According to IMDB, Steve won’t be making an appearance in 10 Years Later, but hopefully his brother J.J. can unveil Steve’s origin story. Did Gail and Aaron’s relationship go further than the last day of camp? One of the more unsettling and confusing conclusions to Wet Hot American Summer is when Gail (Molly Shannon) leaves camp arm-in-arm with her new fiancé—camper Aaron (Gideon Jacobs)—who is much younger than her. First Day of Camp undercuts this by showing Gail’s penchant for starting and ending new relationships rapidly. Over the course of one day, she was to get married to Jonas/Gene (Christopher Meloni), then meets, marries and divorces Jeff Jeff (Randall Park), then finally is introduced to her next love, Ron Von Kleinenstein (Judah Friedlander). It doesn’t look like Aaron will make an appearance in 10 Years Later, and the trailer does hint that Gail had Gene’s child, but it will be interesting to see if 10 Years Later does explain the dissolution of this awkward relationship. What happened between Beth and Henry after the last day of camp? Along with the absence of Bradley Cooper, the trailer for 10 Years Later looks as if Henry (David Hyde Pierce) also won’t be returning to Firewood this season. Henry didn’t have much to do in First Day at Camp, since he didn’t spend time at the camp until the last day, but considering his importance to the film and Beth’s story, it’ll be a shame if these two aren’t reunited. Wet Hot American Summer concluded with the two of them planning a move to Cape Canaveral for Henry’s new job after winning the Hopkins Award, with Henry saying Beth would come back to Firewood each summer, and Beth announcing she’s pregnant. That’s a lot of plots to follow up on, not to mention the resurrection of Beth’s past lover Greg and Beth planning to sell the camp. Which, hey, when did she own the camp anyways? There’s so much that could potentially happen in Beth’s story, it’ll be curious to see if 10 Years Later just glosses over her relationship with Henry. Will the “Indoor Kids” make a return? Speaking of Henry, one of the most fun cameos in First Day of Camp came from a brief appearance by the “indoor kids,” the lamer kids at camp who did science projects with Henry on the last day of camp. In that season, they played different characters, likely because of age discrepancies (when has that ever held this series back? ), but in 10 Years Later, there’s no reason why the characters known as “Mallrat Girl” and “Mork Guy” couldn’t appear as their original characters. Fingers crossed that Keith Stat from Millburn, New Jersey is now married to Alexa, since she put a level 5 charm spell on him. Where did all the new characters from First Day of Camp go by the end of the summer? First Day of Camp introduced an entire new cast of characters who were never seen in the film. Some are explained away handily, such as Yaron, Donna and Claude Dumet (John Slattery) all leaving on the same day they arrived. But what about those who stuck around? Where were they on the last day, and will we catch up with any of them ten years later? There’s a whole group of younger campers, like Kevin (David Bloom) and his bully Drew (Thomas Barbusca) who could easily cameo as older versions of themselves. First Day of Camp opened up the Wet Hot world quite a bit more, so we’ll see if 10 Years Later sticks to the older campers, or keeps up with some of the newer cast members as well. Ross Bonaime is a D.C.-based freelance writer and regular contributor to Paste. Douchebags are a hygienic product. He takes that as a compliment. You can find more of his writing at RossBonaime.com and follow him on Twitter.